The International Patient Advocate Network (iSPAN) held its second meeting on October 31, 2007 prior to the annual meeting of the Connective Tissue Oncology Society (CTOS) annual meeting in Seattle, Washington. iSPAN is open to all patient advocacy organizations and committed individuals with the goal of fostering communication and collaboration to improve the lives of those diagnosed with sarcoma. iSPAN serves as a common voice to support sarcoma patient advocacy, legislation and research. This year over 20 individuals met representing over a dozen organizations. Additionally, the meeting was generously supported by CTOS and by Novartis Pharmaceuticals, Inc. The meeting began with a brief presentation from Arthur Beckert summarizing the history of iSPAN and the goals the meeting. 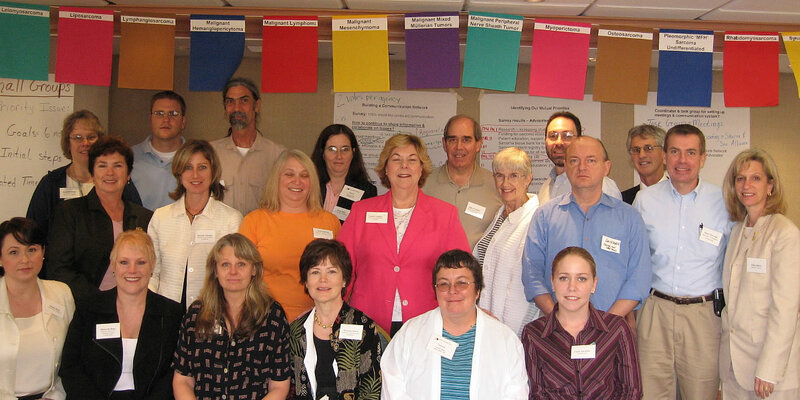 One tangible outcome of the first meeting of iSPAN was the first comprehensive directory of sarcoma organizations. He hoped that advocacy groups would agree that many issues could be better addressed if sarcoma advocacy groups would work together. These include raising awareness, assuring that all sarcoma patients receive the best care in the most appropriate setting, increased funding for research, giving more flexibility for drug research and approval for rare diseases, tissue banking, and patient registry. The group next talked about raising awareness about sarcoma in general and about the unique needs of sarcoma patients. Currently there are a number of sarcoma awareness events in the US, mostly in June and July. One step in raising awareness would be for the sarcoma community to agree on a common time for awareness events. Bruce Shriver of the Liddy Shriver Sarcoma Initiative gave a presentation about the Team Sarcoma Initiative and the incredible growth this has had during the past few years. The group agreed that designating July as Sarcoma Awareness Month would give everyone a long period of time to put together events to bring attention to sarcoma. Everyone agreed that there was no pressure or need for any organization to modify their existing calendar. However it is hoped that organizations would organize events that would generate local, regional or national press coverage. These events could be coordinated with existing activities such as Team Sarcoma or could be held on their own. Events could include walks, runs, picnics, educational session at hospitals, and even include governmental proclamations of July of Sarcoma Awareness Month. Finally, everyone agreed that this idea should be shared with organizations that were not able to attend CTOS to get their input. Since iSPAN met in November a notice was sent out about designating July as Sarcoma Awareness Month. All comments were positive, so it’s official. Please do everything you can to schedule some kind of event or activity in July. A great opportunity is participating in the Team Sarcoma Initiative. Camille Bedrosian, MD of ARIAD next gave a presentation on the upcoming Phase III trials of Deforolimus (formally AP23573). The trial will be open to those with metastatic soft tissue and bone sarcomas. Deforolimus is an mTOR inhibitor that affects cell growth, division, metabolism and angiogenesis. By blocking mTOR the cancer cells will starve and die. ARIAD recently received FDA approval for the Phase III study design; a number of centers throughout the world are participating in the trial. ARIAD hopes to enroll 650 patients at 125 sites. Mark Thornton, MD next gave an overview of the Sarcoma Foundation of America (SFA) and its efforts to improve the FDA’s drug approval process for rare diseases. SFA along with the Alliance Against Alveolar Soft Part Sarcoma has petitioned the FDA to modify its drug approval process for rare diseases. This "Citizen’s Petition" can be approved through an administrative process and does not need changes in current regulations or law. Briefly this petition outlines a streamlined process for testing and approval for new agents for rare cancers. Estelle Lecointe, AFPS, Ensemble contre le GIST gave a presentation on activities of the GIST community in France. The most important is their support of two clinical studies. Everyone agreed that it is important that the advocacy community work together on the many issues of common interest. It is equally important that iSPAN serves as a vehicle of support for the sarcoma community so that every organization can continue to grow and prosper, retain their independence and stay true to their mission. Camille Bedrosian, MD	- ARIAD Pharmaceuticals, Inc.
Ross Pettit, MD	- ARIAD Pharmaceuticals, Inc.
Fatima Scipione	- ARIAD Pharmaceuticals, Inc.
V5N1 ESUN. Copyright © 2008 Liddy Shriver Sarcoma Initiative. A collaboration summit of directors of various sarcoma advocate organizations convened on November 19, 2005 in Boca Raton, Florida, for three hours before the start of the 11th Annual Connective Tissue Oncology Society (CTOS) Meeting. The group launched a collaborative alliance called, International Sarcoma Patient Advocate Network (iSPAN). Over the last five years, multiple groups and foundations have sprung up in the sarcoma community. The meeting was a beginning attempt to support and strengthen all our mutual efforts and effectiveness. A pre-meeting survey and phone interviews solicited opinions and suggestions from those who could not attend, as well as those who did. All participants unanimously expressed great support for networking and desired continued communication among the sarcoma foundations. A directory of 50 sarcoma advocate organizations & foundations has been drafted and distributed among the groups. The directory helps to identify each other’s services. Not only can we now better direct patients to get the specific help they need, but also support each other’s efforts by adding all the website links on our own. A task group was also formed to plan future annual iSPAN meetings and communications. Recruitment & training of future sarcoma "EXPERTS"
Two iSPAN Task Forces were formed and created goals with concrete action plans for the next six months. Those interested in participating on either of these iSPAN Task Forces are encouraged to contact me. From the enthusiasm expressed by all advocates, researchers, oncologists, survivors and caretakers, we know that this network holds tremendous potential for joint projects and an unified voice on behalf of all sarcomas. We have taken the first steps of meeting each other, defining our common goals and committing to on-going communication and partnership. To join iSPAN or to be added to the directory of sarcoma advocate organizations and foundations, please contact me. The creation of iSPAN is to the credit of our advocate leaders, who are proud and passionate about their work, and wish to have an even greater impact on saving lives. Special thanks goes to Deborah Buks for her facilitation help and to the Sarcoma Alliance for providing the meeting room, food and printing of the directory. Editor's Footnote: The entire sarcoma community owes Sharon its sincerest thanks for finally making this often talked about meeting actually happen. She undertook numerous information gathering tasks and analyzed the data and presented it in an extremely useful way. She and Deborah complemented each other nicely during the meeting. All this helped enormously to make the meeting a success and result in the formation of iSPAN and its Task Forces. This simply would not have happened without Sharon's dedication to and skill in bringing it about. V2N6 ESUN. Copyright © 2005 Liddy Shriver Sarcoma Initiative. 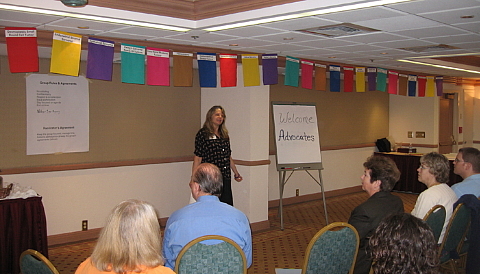 Thirty-two flags, one for each main sarcoma subtype, hung in front of the International Sarcoma Patient Advocate Network (iSPAN) meeting on November 19, 2005 in Boca Raton, Florida. The flags gently moved and reminded us all of the reason we were coming together to join forces. Some of us had lost loved ones to sarcoma. Others were there to support their loved one’s on-going battle. And a few of us were fighting to stay alive ourselves. In the Tibetan tradition, prayer flags are hung to send wishes for well being, to celebrate an event, or in honor, sometimes remembrance of another. As the wind carries the prayer off the cloth and into the heavens, the blessings are released to benefit the one who hangs them as well as the rest of the world. Prayer flags are a heartfelt gift to those who need health, happiness, hope and strength. Traditionally, prayer flags are made of 100% cotton fabric, of any size or color. A simple hem along the top of each square secures it to the cord on which it is hung. Tibetan monks carved ornate wood blocks to print their messages on the fabric. You can buy authentic prayer flags, or make your own. It is common to personalize your prayer flags by writing names, dates, poems, messages, as we do on gift cards. It is our mindful intention, compassion and loving kindness in which the flags are made, that creates the healing blessings. Hundreds of flags made of index cards taped to string by school children after the 9/11 terrorist tragedies, personalized with their own thoughts and decorations, are as powerful as any made by dedicated monks in the monasteries of Tibet. The prayer flags I made for this event, were about 10" wide and 12 " long. The names of the sarcoma subtypes were printed on "iron-on" transfer cloth, available at all fabric or craft stores. The most challenging part of making these flags was attaining the list of sarcomas. The World Health Organization (WHO) offered the most comprehensive categorization of sarcomas, but it is in the process of being re-written and updated. Several sarcoma experts were consulted, and although there was no absolute consensus, the list below best represents the main types of sarcoma tumors. It is my hope to see more & more sarcoma prayer flags with personal messages of hope and healing hanging above in sarcoma centers, support groups, advocate meetings and fundraising/awareness events all over the world. "Blessings On The Wind: The Mystery and Meaning of Tibetan Prayer Flags," by Tad Wise with a foreword by Robert Thurman. The gift book comes with five authentic prayer flags. Click here to visit the West Wind Collection website and read about this book and many types of prayer flags. Learn About Prayer Flags on the Radiant Heart website. Earlier this week, we received the following invitation and attachment to an upcoming meeting of sarcoma advocacy organizations. We are publishing this material as we want to encourage you to contact any of the sarcoma organizations that you have knowledge of and encourage them to attend and, equally important, to suggest to them issues and ideas that you believe should be discussed when they meet in November. Over the last five years, multiple groups and foundations have sprung up in the sarcoma community. This workshop is to support and strengthen all our mutual efforts & effectiveness. Define mutual goals and collaborative strategies. One to two key representatives of a non-profit organization created for sarcoma advocacy. All foundations focused on any type of sarcoma are encouraged to attend. Where & when is this workshop? Boca Raton Bridge Hotel (within walking distance to the CTOS conference). Saturday, November 19th, 2005, 8:30 am to Noon. This does not conflict with attending the other CTOS sessions. Many sarcoma leaders have voiced a need for such a meeting. Several volunteers from multiple organizations have contributed to make this meeting become a reality. A neutral facilitator will moderate this workshop. Submit your group’s information to be distributed in a "Sarcoma Advocate Directory." Do I need to register for the Collaboration Summit? Yes, contact Sharon Anderson @ 650-994-2748 or by e-mail. The Collaboration Summit is free. To attend the CTOS conference sessions, you must register & pay a fee. V2N5 ESUN. Copyright © 2005 Liddy Shriver Sarcoma Initiative. Front Row: Ginger Kyle (Amschwand Sarcoma Cancer Foundation), Deborah Buks (SARC), Sharon Anderson (LMS Surviror), Suzanne Kurtz (National Leiomyosarcoma Foundation), Yvonne Blixt (GIST Support International), Tricia McAleer (Lift Raft Group) Second Row: Beverly Shriver (Liddy Shriver Sarcoma Initiative), Marlene Portnoy (Desmoid Tumor Research Foundation), Joan Darling (Children's Oncology Group), Louise Gallun (Sarcoma Foundation of America), Doreen Trucano (Karen Wyckoff Rein in Sarcoma Fund), Dave Marsh (Kristen Ann Carr Fund), Mark Thornton (Sarcoma Foundation of America), Ellen Silver (Sarcoma Alliance) Back Row: Susan Erickson (Jennifer Hunter Yates Sarcoma Foundation), Chris Yates (Jennifer Hunter Yates Sarcoma Foundation), Dave Murphy (Sarcoma Alliance), Penny Duke (GIST Support International), Mike Trucano (Karen Wyckoff Rein in Sarcoma Fund), Tom Sawrtz (Liddy Shriver Sarcoma Initiative), Arthur Beckert (Sarcoma Alliance). Bruce Shriver (Liddy Shriver Sarcoma Initiative) attended the meeting and took the photo (does not appear in it). Additional participants missing from the photo are: Karen Murphy (Northwest Sarcoma Foundation), Edward Chang (Karen Wyckoff Rein in Sarcoma Fund), and Sara Rubinoff (Lift Raft Group). Marie Podevin and Matthieu Lemchand (SOS Desmoide Association, France) were very much involved in the networking, but missed the meeting due to a flight delay.